There aren’t many shows that leave me reeling for hours and staying up all night because of the energy it instilled in me, but Tuxedo was something else. Playing two sold-out nights in San Francisco at The Independent, soul-funk band Tuxedo, made up of Grammy-nominated soul singer and artist Mayer Hawthorne and hip-hop producer Jake One (50 Cent, G-Unit, De La Soul), brought the high energy, funk and — you bet — tuxedos to the intimate music venue. “We’re playing the same exact set as last night, but you guys are something else,” Hawthorne exclaimed into the highly-energetic non-stop dancing Sunday crowd. The duo is on their “#2ndTourAround” and made their second stop in San Francisco, adding an extra night this past Mother’s Day weekend. They released their follow-up studio album Tuxedo II this past March and are on their U.S. summer tour through the end of June after having played a couple of DJ sets following the release of their album in Europe and Asia. Equipped with a full band in classy nightwear and a blow-up red heel for accessory, the pianos, keys, drums, guitars, synths and even One’s key-tar took their sound back into a ’70s dancehall as the funk was real. Lead single “2nd Time Around” which featured Hawthorne and backup singer/vocalist Gavin Turek‘s synchronized dance movements was pleasant to watch and made everyone’s hands go up in the air. “Number One,” a song in which they sampled Snoop Dogg’s “Ain’t No Fun,” was funky and easily brought you into a singalong. When people say they make ’70s-inspired soul, I could definitely feel it because their music was the kind you want to dance, groove or just have a fun date night to. The ’70s were all about feel-good “dance like nobody’s watching” feelings, and this night was full of it. The duo played songs from both their albums in a little more than an hour — something that went by far too quickly for an overly-energetic crowd. The duo barely made any stops in-between their songs which contributed to the night’s consistent funk euphoria. When their set ended, I could barely wrap my head around what just happened as it ended in the blink-of-an-eye. But it’s no wonder Tuxedo is selling out shows across the country. Their music is infectious and a part of the reason they’re so successful is because nostalgic music is always familiar to people — you can’t deny something that just makes you want to get up and dance. Tuxedo would not have been complete without Turek, who shone at the back of the stage in her glittery gold dress and energetic dance moves. “Shine” instantly became a favorite as Hawthorne and Turek sang back-to-back in conversation with each other about love. It was an ode to pure ’70s music — and a sweet one to watch at that. 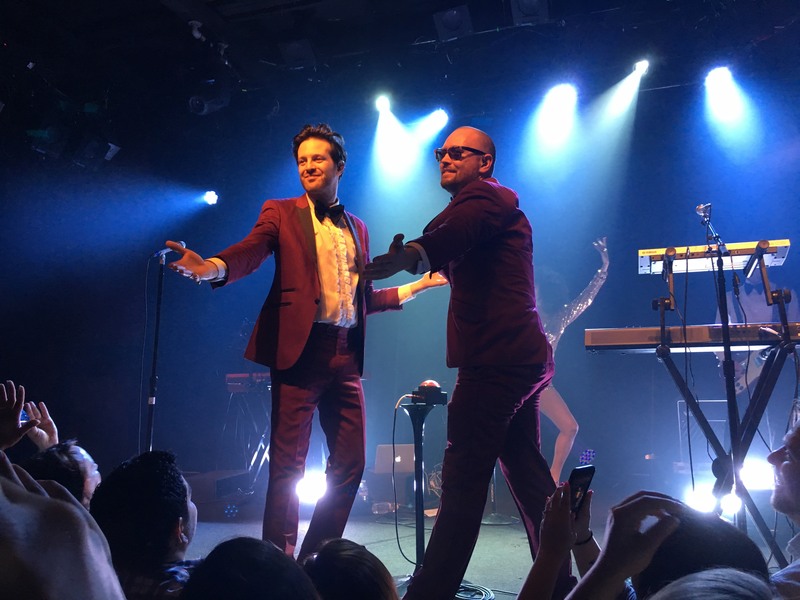 Mayer Hawthorne’s charisma and Jake One’s calm, cool, collected sunglass-wearing vibes powered the night. It’s not often you see a hip-hop producer work with a soul artist and together, they weren’t afraid to make baby-making music that people say is just a warmup to a hot date night. San Francisco clearly loved Tuxedo. With two sold-out nights and a hell of a show, they’re worth the night out. They know how to throw on a party but be classy about it, too. Tuxedo's record Tuxedo II  (2017) is available to purchase now. Keep up with Tuxedo at tuxedofunk.com.